Venezuela (4-2-3-1): Baroja; Carabalí, Fuenmayor (Vargas, 46′), Sánchez, Cichero; Lucena (c), Figuera (Acosta, 58′); Gómez (Murillo, 56′), Farías (Arteaga, 64′), Lugo (L. González, 46′); Blanco (Ocanto, 82′). Honduras (4-3-3): Valladares; Crisanto, Figueroa, Leverón, Sánchez (Palacios, 69′); Peralta (Delgado, 76′), Claros, Martínez (Cardona, 82′); Quioto (Discua, 62′), Lozano (Tejeda, 75′), Castillo (Acosta, 36′). Following last week’s 3-2 away victory, Venezuela picked up their second consecutive win against Honduras in the two nations’ friendly double-header, with local debutant Jhon Murillo ensuring that his former club manager Noel Sanvicente enjoyed a triumphant return to his erstwhile stomping ground. The Estadio Agustín Tovar, built in anticipation of Venezuela’s hosting of Copa América 2007, is the home of Zamora FC, the current leaders of the Torneo Clausura and the reigning two-time champions of Venezuela. Before taking the national job last July, it was Sanvicente who managed this club to these two titles – the only two in their modest history – and appropriately, in what was La Vinotinto‘s first home game under his guidance, he received a hero’s welcome upon his return. 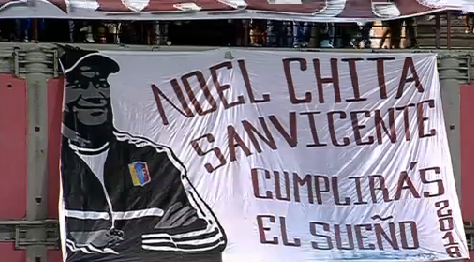 Banner Tribute to Noel Sanvicente, expressing the fans’ support and belief that he will fulfil the nation’s dreams by qualifying for the 2018 World Cup (Image: Bet365 match feed). The game itself was contested by home-based players plus one MLS-based Honduran who lasted little more than half an hour – more on this later. Whereas Jorge Luis Pinto, mastermind behind Costa Rica’s World Cup run, opted to experiment with his new squad by making seven changes from last week’s encounter, Sanvicente only made one alteration – one which was forced upon him. Indeed, Rómulo Otero – the pivotal figure who played a crucial role in all three of Venezuela’s goals – was injured in club action for Caracas FC at the weekend and was replaced in the line-up by club colleague, Edder Farías. That the majority of the Venezuelan players were also in domestic action at the same time as Otero was a factor that their Honduran counterparts did not have to contend with and may have had some effect on this game’s dynamics (or lack, thereof). The play was, for the most part, sluggish and devoid of any sustained rhythm or fluidity, something that the players’ relative unfamiliarity with one another was no doubt also partly responsible for. However, the opening exchanges were rather lively, with Farías driving a loose ball at Honduras’ returning World Cup goalkeeper, Noel Valladares, and within 17 minutes the two sides were level. The visitors looked to be relishing their role as potential homecoming saboteurs when, with 9 minutes on the clock, Rubilio Castillo’s decent low long-range effort was parried by Alain Baroja, only to be rapidly chipped back into the area from the left by Romell Quioto for Anthony Lozano to powerfully head in. The hosts responded 8 minutes later from a free-kick just outside the right edge of the area. Argenis Gómez – who played a role in two of the goals in last week’s encounter – swung in a fine left-footed ball that was met by left-back Gabriel Cichero, whose header into the goalmouth found the trailing left leg of captain Franklin Lucena. Though Jorge Claros managed to hook it away, the linesman flagged that it had already crossed the line – parity had been restored. One recurring theme of the first game between this pair was the high number of petulant fouls committed, a feature that was to recur to a slightly lesser extent in the subsequent phase of play. Within no more than two minutes of play, both Honduras’ Castillo and Venezuela’s Juan Fuenmayor were booked for offences on each other, though the likelihood of their tussles resulting in a red card or two was abruptly averted when Castillo went off injured after 36 minutes. Before the match reached this point, however, two notable incidents had occurred. Firstly, after 22 minutes, from the free-kick conceded by Fuenmayor on Castillo, Mario Martínez lined up a free-kick from the right flank 35 yards out. Struck with his left peg, his curled ball was met on the volley by Lozano’s outstretched right boot and his effort caused a few jitters but went narrowly wide into the side-netting. However, any Honduran hopes of regaining the lead were dealt a blow by the second incident worthy of comment in this period: Jorge Claros, arguably the most high-profile player in this line-up owing to his performances with Sporting Kansas City, receiving his marching orders for a wild high-foot challenge in midfield, some 5-6 feet off the ground. Yet with ten men, the visitors certainly did not crumble and were to have at least a few more chances worthy of comment in the game, the closest one coming on 37 minutes, just several minutes after the dismissal. An exquisite left-footed diagonal ball by Martínez on the turn from the half-way line was taken adeptly in the stride of Quioto who, from inside the area on the left lashed a low shot that was to come off the inside of the post and agonisingly trickle back across the goalmouth. Whether or not Baroja got any of his left glove on this is open to debate, though if he did, as the margins involved here were so thin, this contact surely stopped the ball from crossing the line. Though this reminded Sanvicente of the threat Honduras could pose even with the numerical disadvantage, he opted to make some attack-minded substitutes at the break. Off came centre-back Fuenmayor and attacking midfielder Jesús Lugo to be replaced by Luis Vargas, who appeared to operate in a deep-lying playmaker role, and debutant Luis ‘Cariaco’ González, who was largely to be found in advanced positions on the left. The second half, perhaps partly due to it consisting of one side with many players who were contesting their third game in eight days up against a team trying to compensate for being a man down, was rather short on chances. However, when the first of note came after 57 minutes, it resulted in the winning goal. This was scored by Venezuela’s third substitute, local hot prospect – and hot-head – Jhon Murillo, a remarkable 37 seconds after arriving on the pitch. The Zamora winger as well as the unused José Marrufo were both not in the original squad but were called up on the strength of their performances at the recent South American Youth Championship. He replaced Gómez on the field and was soon found on the right side of the area by the long searching ball of club team-mate Vargas. Murillo won an aerial duel to guide the ball into the area, where defender Johnny Leverón – back home after a season with Vancouver Whitecaps – horribly miscued an attempted clearance. Under no real pressure around his own six-yard box, he acrobatically hit the ball over goalkeeper Valladares – who had come out to claim it – and Murillo, with predatory anticipation, burst forward to chest the descending ball in from little more than a yard out – a dream debut for the substitute. It was certainly not a bad moment for Sanvicente either, with the move beginning with one former charge of his at club level and then finished off by another in what is their present, and his former, home ground – an ideal winning scenario. In the rest of the half, after Cichero, González and Vargas all hit shots either wide or over from rather optimistic positions, Venezuela had their only other concrete chance. This came from another substitute, Manuel Arteaga, who capitalised on a poor midfield pass to rob a defender but then, from the edge of the area, shot far too close to Valladares. Up the other end, the visitors mildly threatened first with a cross that was well-headed away for a corner and then a subsequent effort from outside the area that went comfortably wide. Their best chance, however, came with what proved to be the last kicks of the game, as Bryan Acosta’s free-kick was flicked on by Ángel Tejeda, which Baroja did well to see at a late stage and dive down low to parry out to the left. Not long after, the whistle sounded and Noel Sanvicente had attained his second consecutive victory over his Central American opponents – also the second win of his reign, following defeats in his opening four games. A Worthwhile Pair of Games? Quite what the coach will draw from both games is difficult to ascertain as the constitution of the teams bore very little – if any – resemblance to the sides he is likely to select when Venezuela play competitive fixtures and the full overseas contingent is called up. Left-back Gabriel Cichero is the only player likely to retain his place in future line-ups and he will be pleased to have had little to trouble him on his side of the pitch, as well as notching an assist. Defensive-midfielder Franklin Lucena will surely have been buoyed at starting, being named as captain for both games and scoring a goal – he is surely now back ahead of Rafael Acosta and Édgar Jiménez (the latter of whom was not in the squad) in the pecking order. However, he is unlikely to receive a first-team place ahead of the supposed preferred pairing of converted right-back Roberto Rosales and official captain Tomás Rincón. Furthermore, with his 34th birthday coming up within a week, it remains to be seen how much of an international future the Deportivo La Guaira man has. Alain Baroja, though he is very unlikely to replace Tenerife’s Dani Hernández as number one goalkeeper, will nevertheless be delighted to have played both games and surely consolidate his position as second-choice ahead of Rafael Romo. Regarding the defence as a whole, though their performance certainly improved and was more assured, that they still failed to provide Sanvicente with his first clean sheet will be a lingering concern. Further upfield, both Argenis Gómez and, to a greater extent, Rómulo Otero did much to enhance their claims for a regular squad place. Though the attacking midfield slots are the most competitive positions at present, Otero’s absence from the second game arguably only helps to preserve the perception of his star performance in the first game and bolster his personal cause. Finally, in the forward positions, though both Edder Farías and Richard Blanco scored in the first game, to see either in a future squad for a competitive game would be a surprise. Not only are there plenty of overseas-based rivals in this area but there is also competition from the top-scoring home-based Venezuelan who was unable to join this squad as he was busy enhancing the domestic league’s reputation in sensational fashion. Indeed, immediately after the second national game had ended, Gelmin Rivas fired Deportivo Táchira through to the Copa Libertadores group stage, getting both goals away to Paraguayan giants Cerro Porteño as his side’s 2-2 draw ensured a 4-3 aggregate victory. To have three sides involved in this phase of the continent’s premier competition is very rare and this, along with the two national victories, marked a much-needed morale-booster for Venezuelan football. It will be curious to see whether Rivas can maintain his form and earn what would be a somewhat unanticipated call-up to the senior side for their two friendlies in late March against Peru and an as-yet-unconfirmed opponent. These two games are currently the last scheduled chances to alter Sanvicente’s plans ahead of Copa América, so whoever ends up in the squad will be best-advised to make the most of their opportunity. With the coach having always been at least a few key players short in his squads up until this point, those that do receive a call-up will be acutely aware that there are certainly some places still yet to be determined. This entry was posted in Venezuela National Team and tagged Alain Baroja, Andrés Sánchez, Anthony Lozano, Aquiles Ocanto, Aragua FC, Argenis Gómez, Arquímedes Figuera, Caracas FC, CONCACAF, CONMEBOL, Deportivo Anzoátegui, Deportivo La Guaira, Deportivo Táchira, Edder Farías, Francisco Carabalí, Franklin Lucena, Friendly, Gabriel Cichero, Gelmin Rivas, Honduras, International Friendly, Jesús Lugo, Jhon Murillo, Jorge Claros, Jorge Luis Pinto, Juan Arango, Juan Fuenmayor, La Vinotinto, Luis González, Luis Vargas, Manuel Arteaga, Noel Sanvicente, Noel Valladares, Rafael Acosta, Rafael Romo, Richard Blanco, Roberto Rosales, Tomas Rincón, Trujillanos FC, Venezuela, Vinotinto, Zamora FC, Zulia FC on February 14, 2015 by hispanospherical.